Juicing fruits and vegetables is nothing new, in fact, it has been around since the 1930s. However, in the last few years, we have entered a new era of juicing, a juice craze if you will. It is apparent all over the internet with recipes that tempt the eyes, even more so than the stomach, and is very evident with the amount of “juiceries” popping up all over cities. In New York City, for example, you are never very far from one of these establishments, not unlike a Starbucks. Carrying around a green juice almost seems to be a fashion accessory, as celebrities are often photographed doing so. I must admit, I do feel cooler and healthier when I am toting around a bottle of the green stuff. However, am I healthier for drinking my fruits and vegetables? The short answer is no, it is better to eat your fruits and vegetables than to drink them. However, that doesn’t mean that juicing needs to be avoided. Let’s take a look at the pros and cons of juicing and what to keep in mind when consuming them. 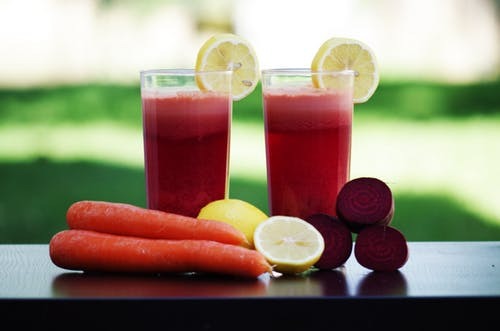 The main problem with juicing is that it removes the skins and pulps, which in turn reduces the food’s dietary fiber.1 That dietary fiber helps your body process the sugars from the fruit and keeps you fuller longer.1 Another con of drinking your fruits and veggies is that you are sure to consume more sugar than you realize. Some companies add more fruits than vegetables to sweetened up their beverages. For people watching their sugar intake, this is an important aspect to look out for, especially without the fiber in place to slow down the sugar absorption. Another negative to juicing is the cost. If you are purchasing the store bought version, each bottle averages $10, which is an expensive snack. If you are juicing at home, the produce is cheaper but you have to buy large quantities to yield a small amount of juice, not to mention the time-consuming cleanup. The juice craze doesn’t appear to be going away any time soon. While these beverages do provide some vitamins and nutrients, they are not as healthy as actually eating the whole food itself. However, it is a better alternative to most snacks and allows you to reach your daily recommended fruit and vegetable goals. Just be mindful of the amount of sugar per serving when choosing your drink of choice. One way to get the best of both worlds is to blend instead of juice. By putting the edible portions of the ingredients into a blender, you will be able to retain the fiber portions of the produce.1 Blending allows for more opportunities to get creative with additional healthy ingredients, such as nut butters and yogurt. Also, blenders are way easier to clean. Remember, however you get your fruits and vegetables, you are nutritionally fashionable! This entry was posted in Cooking, Diet Tips, Fill Your Plate, Food, Food Facts, Fruit, Health Tips, Healthy Eating, In the Kitchen, Produce, Recipes, Vegetables and tagged Easy, Fruit, Health food, Juice, Veggies, Vitamins and Nutrients. Bookmark the permalink.